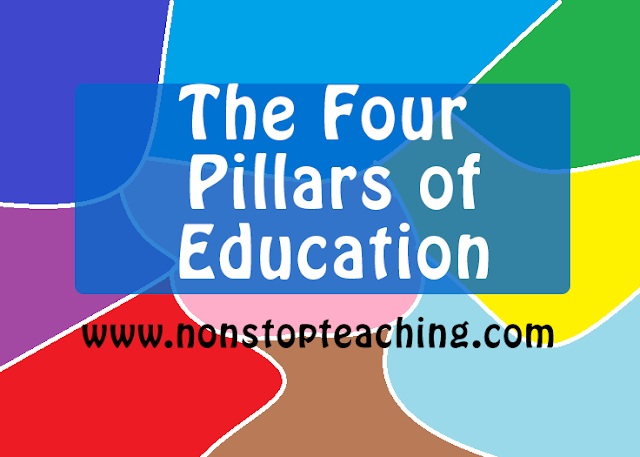 According to UNESCO the four pillars of learning are the fundamental principles for reshaping education. Focuses on combining broad gen. knowledge and basic educ. with the opportunity to work on a small number of subjects in the light of rapid changes brought about by scientific progress ang new forms of economic and social acitivity. Learning how to learn and to discover, as to benefit from ongoing educational opportunities continuously arising throughout life. Developing the faculties of memory, imagination, reasoning and problem solving. Emphasizes on the learning of skills necessary to practice a profession or trade. Applying in practice what has been learned. Developing vocational / occupational and technical skills. Developing social skills in building meaningful interpersonal relationships. Developing competence, social behavior, aptitude for teamwork. Enhancing the ability to communicate and work with others. Prioritizes the development of the human potential to the fullest. Tapping the talents hidden with individual. Developing personal commitment and responsibilty for the common good. Emphasizes understanding of others, their history, tradition and cultures, and also living and interacting peacefully together. Being receptive to others and encounter others through dialogue and debate. Working toward common objectives in cooperative undertakings.